We have six kids, 10 and under, which means that we have a busy and blessed (and loud) household! 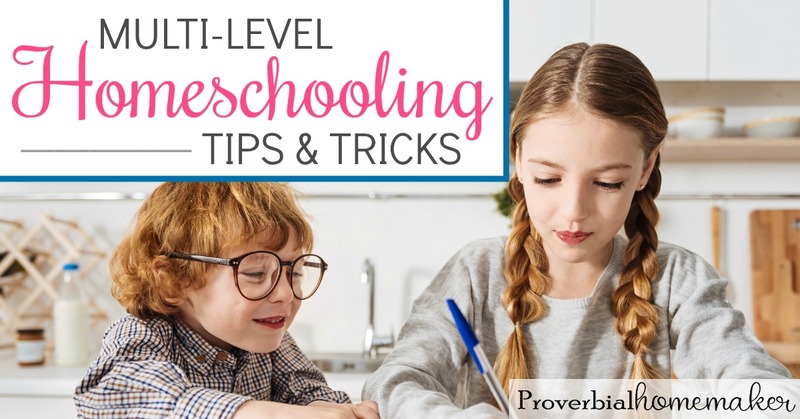 One of my biggest challenges has been homeschooling with little ones in tow — handling the toddlers and infants well when trying to “do school” with the olders. After some years under my belt managing the chaos, here are several ideas to help you do the same! One of the best pieces of advice I’ve heard, and the hardest to follow for some reason, is to make them first. But it’s true! I know from experience. Play with toys, build a tower, or read books with them. Have a special book basket just with learning toys and books for this time together. Include them as a special helper during your morning routines! Include them on the chores, have them help you get out the supplies for the day, etc. It may seem obvious, but being flexible is probably the biggest key to sanity here. Prioritize lessons by planning the most important subjects and lessons first, so they are sure to get done even if the rest of the day doesn’t stay on track or your little one melts down and needs mama. Establish a routine. No need for strict schedules, but sketch out a good, flexible routine that you can practice to help guide your day. Have catch-up times and days for those weeks that get away from you. Move a lesson forward, do a quick lesson before bed, or make one day or afternoon a week a catch-up day if you’re concerned about getting everything done that week. Let it Go. Yes, there are times when your little ones will need more full attention and all the planned lessons for that week won’t get done. No worries, mama! You’re homeschooling for the long haul here, so everything will pan out. Meal times are favorite times for lessons, especially for read alouds, memory recitation, and discussions. The littlest ones are strapped into high chairs and sometimes that’s aaallll that’s keeping them from inflicting destruction. Blanket time is also an awesome tool! At about 18m old, start teaching them to sit on a blanket for 5 minutes at a time and play with toys set aside for that purpose. After a while, they can work up to 30 minutes at a time and will enjoy it as well. It’s great for doctor’s appointments too! Pack and Plays are great for infants or crawlers with the same basic blanket time training steps. We have one in our living room for the toddler with some toys, books, and a blanket. Even if he protests at first, he eventually settles down to snuggle or play quietly. Car rides are perfect for practicing memory work or listening to audiobooks. Make a recording where you are reading memory verses, Bible passages, or other things you’d like them to memorize. Whether you call them busy bags, busy boxes, or tot trays, these can be a great way to keep your littles occupied while schooling. They are basically activities or toys set aside just for these special times to keep them entertained. Be patient. Busy bags aren’t always a hit initially. Nor do littles always play along and keep themselves occupied while you’re homeschooling. Over time, however, they’ll learn when it’s time to play with the busy bags or other toys while you’re at the table with the olders. Use them during blanket time. They are easily portable and contained, so they are ideal for that purpose. Start simple. Some of ours include simple felt character scenes, counting bears with a small muffin pan for sorting, and geoboards with rubber bands for the preschooler. Put together interesting objects that suit the developmental stage of your child. Teach during nap time for those subjects where your child needs focused attention or you just don’t want someone eating the pencils they’re trying to write with. Or take that time to rest yourself, because you need that some days more than your kid needs a math lesson! And your kids will be happier if mommy is happier. Just saying. Simple art projects in the high chair with chunky crayons, washable paint, or playdoh. Try faux school, giving them something that looks similar to what their older kids are doing makes them happy. 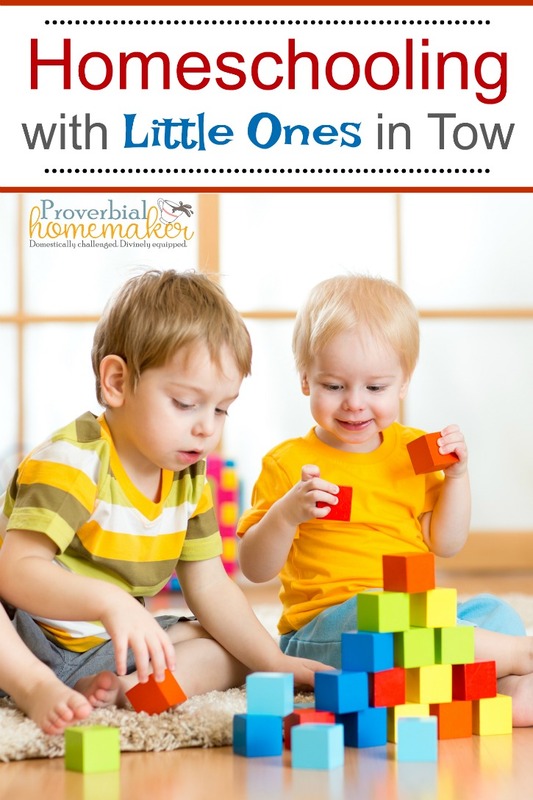 It’s certainly true that homeschooling with toddlers and babies around can be challenging. Hopefully some of the tips here have provided ideas and inspiration for your own household! At the end of the day, we can embrace the chaos knowing that not only is this just a season of life, but it is a blessed one. While little ones may derail the best laid plans, we can model for all our children an attitude of flexibility and forbearance. In fact, having those youngest siblings around teaches our children much in the way of compassion, kindness, and patience. Homeschooling is truly a family affair! You sound busy. My youngest is now five so managing has become much easier. He loves building so a box of Duplo or Brio were really useful when he was about three but there is a stage before that when concentration span is short and he was hard to occupy. “Faux school” is what works for us most often. For instance, yesterday my oldest were coloring a picture where they colored certain blends different colors. I made shapes on a paper for my 3 year old and wrote the blends on them and had him color them whatever color the older kids were doing at the moment. He was learning shapes, colors, and I’m sure it didn’t hurt him to see the blends on there even though he doesn’t necessarily understand what they are yet. Doing what the others are doing keeps him happy. I find that Planned messes are easier to deal with than the unexpected ones, so I’ll give the toddler something messy to play with. Flour/oats/rice with bowls and spoons on the kitchen floor is always a big hit. And I’d much rather sweep that up than scrub marker off the walls or an entire tube of toothpaste out if the sink! Lol! This is the first year I’ll be homeschooling and have a baby to keep busy! Blanket time is such a good idea. I’ll definitely be using that strategy, along with the busy bags. Thanks! I was needing some tips to keep my 2 year old entertained! Great ideas! I love the idea of setting a timer and getting a little bit in while my older child is finishing up from breakfast. Sometime I feel like if I don’t have a huge block of time, then why bother. But that is so not the way to look at school for little ones. 5-10 minutes is plenty at a time. And I love the idea of doing school at lunch. We just started Spanish….and it is great going over vocab while we all eat! We started for this year on July 30th and I’ve spent several days since working on the “boredom bucket”. Things the kids can pull out whenever they want. Some for during school and some for other times PS Thanks for the giveaway. Timber doodle is one of our favorites! Wish I had heard of Busy Bags when I had littles. Sounds perfect. A big ‘ol chunky workbook picked up at Costco can go a long way with smaller homeschoolers! I love busy bags. I need to build more of those to keep my preschooler busy. This year will be weird. My 6 yo boy is ready to start working on letter sounds and such, but so is my 4 yo girl. He doesn’t want to work with her, so I have to juggle that! Thanks for the chance at Timberdoodle awesomeness! I love this. Some of these are a good reminder even for those of us that have kids growing out of these phases. Your home sounds joyful! I don’t have any littles anymore, but if I did these would be great ideas to try out. I love all the different ideas. my oldest is only 7 so we school during nap time, but this year we’re adding in a five year old so it’ll be interesting to see how that goes. My 3 year old is pretty independent so it’s mostly trying to figure out how to occupy the 1 year old. I have six kids and one thing that helps me get it done is to always have an activity or assignment ready to go that the bigger kids can do on their own. When the baby or toddler looses it I pull out the activity and I can step out and take care of the little one without losing the older ones too. This is my first year using Busy Bags- I appreciate the encouragement because they haven’t been as big of a hit as I had hoped! I will keep trying! I most love the recommendation to record things we want them to memorize! My kids are all older now, but I remember the years when I had little ones. I had 4 kids in 7 years. I just want to encourage younger mothers to hang in there. Even when things don’t go even close to what you had planned, your kids are learning. Remember this it is a marathon not a sprint. Some great tips! My toddlers like to “do school” when their bigger brother is working. It really helps for me to set them up with a craft while working with my older. They really love to be included in. I love getting your emails every day! “Faux school” works great for us right now, too. Dollar store workbooks look enough like the real thing to satisfy my copycat 3 year old. Thank you for the opportunity to enter! I love love love Timberdoodle! I love all of the great suggestions for little ones! I do and like many of the options you presented in your article. I also plan times where an older student (meaning perhaps 2 yrs. older) will sit and play with the youngest in my family ( now 6mo) for around 10 minutes up to 30 minutes if all is happy. I encourage them to actually play with the baby…show them how to use the toys, flip through a board book and comment on the pictures, review animal sounds, colors, shapes, the ABCs, songs, etc. Then I switch and have another ‘older’ child do the same, all up until noon ( we all take a ‘recess’ at 10, so I can feed baby and they can run outside, etc). This way they are still always in my sight, on my radar, but they are growing confident in what they have learned by attempting to pass it on to someone else, they get to play, have a brain break, but not be totally derailed on their own school work. and the baby loves the one on one time with each. After noon, I have done all the one on one teaching of the others, so I am then able to spend focused time myself with each of the littler children. This has worked for us for several years now. I have 8 children if that is helpful for anyone to know.lol. Can’t even tell you how many times busy bags or trays set up with activities little ones can do have saved my sanity schooling with littles ones. I also try to include my little one in with what we are working on. Thank you for these useful tips! Having a flexible schedule is something I need to work on. Your posts are so inspiring! Thanks for the time you put into these! I love the tip of including them and making them a special helper! We did this in elementary public school, so why not at home too? Would love to have this gift card for homeschooling. What a blessing this would be. My 3 year old learns best from his 5 year old sister. He copies her words and actions so much. I love the list of suggestions on keeping the little ones busy. I am a mom of five myself, keeping the younger ones entertained has always been a challenge for me.